Creating your dream kitchen can be daunting. One of the first things to consider is what type of layout will fit into your space. If your space is long and narrow, then the galley kitchen layout will work best. If the space is a large square, then a design with an island might work. If your space isn’t particularly large or small, a U-shape layout is a good possibility. Below are some examples of different kitchen layouts based on room shape. The galley layout is used when the space is narrow. 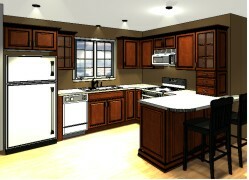 Typically, the sink will be on one side and the cooking area will be on the other side. This layout can be used a couple of different ways. In one, the cabinets follow the perimeter of the room in a U-Shape. The second way is more of an open concept, and is also the most common. One of the ends will just have base cabinets and be open to the next room. This creates a peninsula, allowing for extra seating on the other side. This layout is typically used when there isn’t enough room for an island. Islands are used when the space is large enough. When using an island in a layout, there must be 36”-48” of clearance around all four sides of the island, with 42” being the most comfortable clearance. Islands can serve many functions. They can be a pure working island, which means there will not be any appliances in it; some will have a prep sink, or even the main sink and dishwasher. Others will have the cooking function. Most will also have seating whether the island be one level or two. While these basic layouts serve general needs, there are many possible variations for individual needs. Depending on whether this will be a family kitchen that needs to accommodate children, a baker’s kitchen that needs plenty of work space, or some other special function, you may want different options. An experienced kitchen designer can help you to create a space that meets your particular needs.